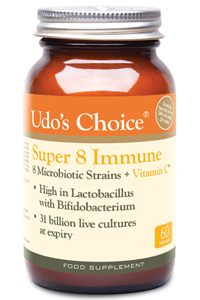 Udo's Choice Super 8 Microbiotic is a powerful formula of eight specific strains of friendly bacteria. Friendly bacteria, or microbiotics, are the beneficial bacteria that occur throughout the digestive system. They are essential for proper digestion, healthy immune function and overall well-being. 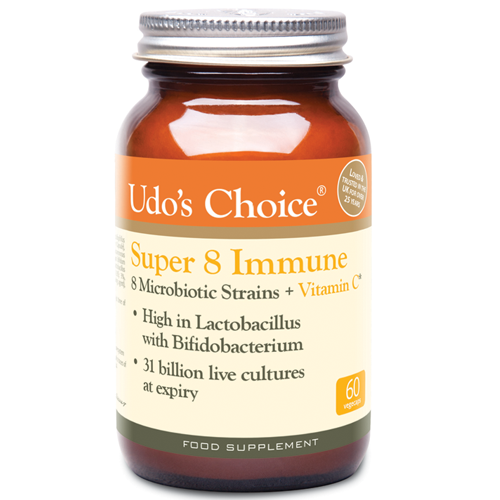 Udo's Choice Super 8 Microbiotics are ideal for travel. Super 8's can be left unrefrigerated for short periods of time, making them convenient for holidays or business travel. Udo's Choice Super 8's contain 42 billion active bacteria in every capsules - 3 times more than a typical Microbiotic drink. Consume 1 capsule per day on a full stomach, or as directed by your healthcare practitioner. Refrigeration ensures maximum potency & stability. Udo's Choice Super 8 microbiotics can be left unrefrigerated for short periods of time and may be frozen.